Every year in the U.S., millions of pets find themselves living in shelters and rescues around the country. For many of these pets, the reason they have been separated from their families is a lack of pet-friendly housing. Last year, I moved across the country with cats and dogs, and saw myself how hard it was to find an affordable rental that allowed me to bring my beloved pets. We started out with more than 40 listings, and while some were pet-friendly, less than a quarter of them were accepting of my two 50-pound dogs. Of that dozen, only three were still welcoming us once they found out one of those dogs was a Pit Bull type — an amiable, arthritic, lazy Pit Bull, but a Pit Bull nonetheless. Luckily, everything worked out in time for our move and we couldn’t be happier with our rental. Start early. You’ll be much more likely to find a place to live if you have enough time. It will take hard work and diligence, no matter what, but the more time you have to look, and the more lead time you can give a landlord, and the more options you will have. Think small. Try looking at rental homes and those managed by the owner instead of large apartment complexes. Individual landlords are often more willing to speak with you and negotiate than property managers who have hundreds of units to oversee. Search creatively. Drive around neighborhoods you are interested in to find “for rent” signs. Individual landlords may just hang a sign in the window instead of paying to use a listing service. Share what you are looking for on social media and “apartments wanted” classified pages. When you speak to individuals, you’re more likely to be treated like an individual, and your pet is too. Be responsible. Make sure your pets are spayed/neutered, vaccinated, and well-behaved and bring proof — such as a letter from your vet or an obedience school diploma. Make a doggy resume. My dogs do some sport and obedience competitions, so I put all of their ribbons in a book and showed them off. Don’t have any awards? That’s OK — show your dog in his best light: Share photos of them with kids or in their Halloween costume; list their best attributes and provide references. Get ready to pay. I believe the single thing that convinced landlords to give us the first call back was when we said this on their voicemail: “We have pets, but we are willing to pay a pet deposit in whatever amount you require.” It wasn’t cheap, but, for me, it’s fully refundable, and it gave homeowners a vote of confidence in us and in our pets. Be friendly. This might be difficult, especially if you have been told “no” a hundred times. But, you’re in a position to change someone’s mind, one way or the other, about pet owners. If a landlord has a dozen applications and you were the only one who brought him cookies, or thanked him with a card for meeting with you, he might be willing to lean toward you when its decision time. Think like a homeowner. 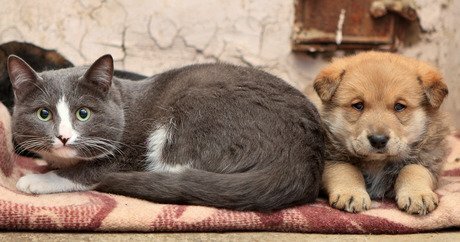 Why don’t most landlords rent to pet-owners? Because they are concerned about property damage, cleanliness, and insurance policies. If you offer a pet deposit, a positive reference from your last landlord, and carry your own renter’s insurance, you have eliminated some of the biggest objections a homeowner may have to pets on the property. The search can feel monumental, but don’t give up! You are your pets’ whole world, and working hard to take them with you will be worth every effort. Do you have tips for renters to help them find a pet-friendly home? Share them in our comments and help families stay together and keep pets out of shelters!